Located in Funchal downtown, the hotel is perfectly located close to major touristic attractions and services.. The hotel renovation was a daring upgrading project entailing an expansion of the old building to achieve a perfect blend of past and present, by merging an attractive classic residence into the contrasting, modern architectural design of the new complex. Enjoy a range of recreational amenities, including an outdoor pool, a fitness center, and bicycles to rent. Additional amenities at this hotel include complimentary wireless Internet access, concierge services, and babysitting/childcare (surcharge). 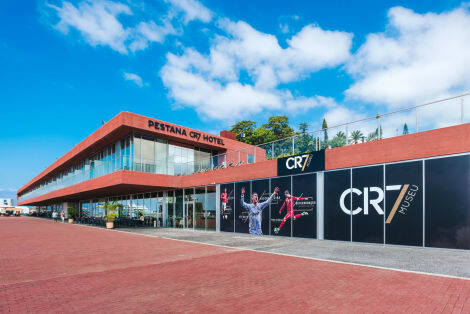 Stay with us at the Pestana CR7 Funchal, a 4-star hotel located on the island of Madeira, in the city of Funchal only 300 metres from the marina. Born from a collaboration between Cristiano Ronaldo and the Pestana Hotel Group, this lifestyle hotel offers contemporary design, making it Funchal's latest hotspot. Here, you'll be welcomed by ambassadors who'll design a truly bespoke stay. All areas of the hotel offer total digital convenience. During your stay, you'll be able to enjoy the rooftop infinity pool, along with the sauna and outdoor Jacuzzi. Work out at the outdoor gym, use the free Wi-Fi and enjoy your meals at the restaurant. Take in one of the best sunsets on the island from the rooftop bar. All rooms feature contemporary design with plenty of natural light, soundproofing and free Wi-Fi. Download the Pestana CR7 App and discover what Funchal and the hotel have in store for you. Our SOMEMO Manager (SOcial MEdia MObile Manager) guarantees that you'll be taken care of before, during and after your stay—here, you'll have The Time of Your Life. Enjoy the best parties and DJ sets at thePestana CR7 Off-side RoofTop with the best views of the city. If you'd like something more laid back, discover the CR7 Pizza, Burger, Beer & Wine; a modern, multi-functional space with an open kitchen, wood-fired stove and bar where you can try our fantastic cocktails. Work out with the "Get in Shape" program, personalized functional training created by the world's best footballer. If you prefer something more relaxing, pay a visit to the Magic Spa on demand at our 24-hour reception. During your stay, don't forget to visit the Museu CR7 free of charge featuring all of Cristiano Ronaldo's trophies and awards. The Casino da Madeira is only 200 metres away, the Centro Comercial Madeira Shopping Centre is only 4.7 km away and the Madeira Airport 23.5 km away. Featured amenities include a business center, dry cleaning/laundry services, and a 24-hour front desk. Planning an event in Funchal? This hotel has facilities measuring 2411 square feet (224 square meters), including conference space. Free self parking is available onsite. Make yourself at home in one of the 109 guestrooms featuring minibars. Cable television is provided for your entertainment. Private bathrooms with bathtubs or showers feature complimentary toiletries and bidets. Conveniences include phones, as well as desks and electric kettles.